Many people while gardening mistaken plants for weeds. 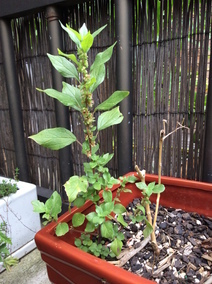 Recently a neighbour of mine replanted a weed thinking it was mint. I love this question because it's so true and I can't wait to read the outcomes. I am a complete green thumb when it comes to any sort of gardening, but love to have a little greenery on my balcony and courtyard. I'm sure I'm very guilty of culling plants thinking that they're weeds. I do try and search for information online - to see whether I can match pictures but to be absolutely honest, I'm completely guessing what is or isn't a weed. Unless it's something I've planted, everything else that grows gets pulled out. I love growing (or more to the point trying to grow my own basil) and unfortunately have not been able to hit the jackpot for anything more successful than a 3-4 week time span. I've come back from holidays and I actually now have something growing in my basil pot but it doesn't really look like basil nor does it feel like basil. It has small buds and flowers but the leaves are furry (the picture is attached in the likelihood anyone has any feedback) ! So ... in short, I generally pull everything out however, I've decided with this little fellow which has taken up residence in my basil pot, to keep it growing. Weeds grow every were. Like grass, because grass is a weed. Weeds tend to grow quickly and in places where plants cant grow. If you see an unknown plant taking over your other plants, that would definitely be a weed. There is actually a university in Perth that is experimenting with this issue. They have found that weeds and plants reflect light differently, and have used this to create something to read how the plants reflects. The machine that they have created uses lasers to shine down on the plant, then collects the data on what is reflected. This alerts what looks like a traffic light that shows green and yellow if it is a plant and green, yellow and red if it is a weed. In the near future, these devices will help with crops. Best golf course in London?